A subtle and aromatic curry dish that serves 4. Stir in the cumin, coriander, cinnamon, turmeric, cardamon pods and chilli. Cook, stirring for about 30 seconds. Add the potato, aubergine, mushrooms and the water. Bring to the boil, cover and then lower the heat and simmer for about 15 minutes. Add the beans and cook uncovered for a further 5 minutes. With a slotted spoon, remove the vegetables into a suitable serving dish and keep warm in a low oven. Allow the cooking liquid in the pan to return to the boil and bubble up until it reduces a little. Season with the salt and pepper and stir in the yogurt, cream and garam masala and allow to heat through again. 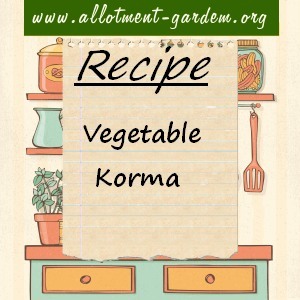 Other vegetables can be used in this korma, including carrots, cauliflower, broccoli and peas. Serve with basmati rice and poppadums.